There are two left standing. 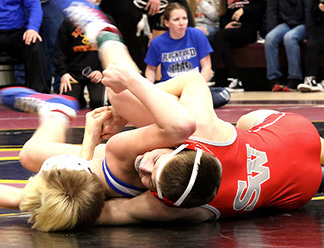 A freshman 106-pounder and a junior 152-pounder will represent the South Winn wrestling program at the state wrestling tournament this weekend. Ethan Maldonado qualified at 106 pounds at the Class 1A District 1 meet Saturday at Denver High School. The freshman was runner-up at the meet and takes a 33-9 season record into his first state meet. It will also be the first state experience for junior Logan Schnuelle who will compete at 152 pounds with a 36-9 season record thus far. One other Warrior, Philip French competed Saturday but failed to advance to the round of 16, finishing third. The state wrestling tournament runs Thursday through Saturday, Feb. 14-16, at Wells Fargo Arena in Des Moines (see box on page A-9 for details). Wrestlers at all district sites, regardless of class, needed to finish in the top-two of their weight bracket to advance to state. There were eight district sites per class, making 16 grapplers at each weight in each class who advance to state. The first stop on the road to state — the sectional meet — was Saturday, Feb. 2. South Winn had three grapplers finish in the top-two at sectionals to move on to the district, which was held at Denver High School in Denver. At districts, wrestle backs are utilized to determine the true second place finisher. If the finals loser and the consolation finals winner (second and third place) didn’t face each other in the first round, they wrestled for the true second place and the final spot at state. The state wrestling tournament begins Thursday, Feb. 14, at Wells Fargo Arena in Des Moines and runs through Saturday, Feb. 16. The first round for Class 1A is at 1:30 p.m. Thursday. Wrestlers need to win once Thursday to advance. If a grappler loses in the first round, he falls into the consolation bracket. If he wins the first match Thursday, he advances to the quarterfinals Friday, Feb. 15. Two losses Thursday will eliminate the grappler from the tournament. Two wins in the first two days guarantees a grappler will medal (finish in the top-eight of their weight class). For the complete story, stats and additional photos, pick up Decorah Newspapers at one of the many convenient locations throughout Decorah and Winneshiek County. Or, for 34 cents an issue, subscribe to Decorah Newspapers by calling (563) 382-4221.